Our first visiting team for April, Sharks CC from Cambridgeshire, England, arrived here from cold, rainy UK to a bright sunny weekend ideal for cricket. On Saturday they started with luck by winning the toss and elected to field first. Marsa’s opening two batsmen Sarfraz Ali (0) and Niraj Khanna (7) didn’t last long, both falling to C Everitt’s first and second over respectively. Sam Aquilina (10) was Everitt’s third victim, trapping the batsman LBW. Skipper John Grima (18) joined the ever steady Joy Ghoseroy (55*) building a well needed team half century partnership. The first ball after drinks brought the dismissal of Grima, bowled by G Jameson. Here A. Brown commenced his bowling spell and swiftly took 4 wickets conceding only 39 runs! N Khosla (14), S Anand (10) and C Belford (15) added valuable runs for the Marsa CC but the show was stolen by young Adam Balakrishnan! Showing precise timing skills he hit the only six of the innings including two boundary’s to finish with 31 runs off 28 balls! Just what Marsa needed. After 40 overs Marsa CC totaled 219 runs for the loss of 8 wickets. The Sharks bowlers were a bit off track with their bowling giving away 40 needless extras in wides and no balls. Marsa skipper Grima set an attacking field to defend their total but when the wickets weren’t falling this soon changed to defending the boundaries. M Mcann and O Perkins (21) built a solid partnership always keeping the run rate steady with Marsa’s score. Having only lost the wicket of C Everitt (6) with 85 runs on the board from 12 overs it was decided that a change in bowling pace was needed. The spinners came on and 3 quick wickets, M Natarajan (0), G Jameson (3) & P Connors (10) fell to A Balakrishnan, G Hewitt and S Ali. A Brown (26) batting at No. 7 swung with aggression and hit a six to up his teams run rate. The Shark’s CC’s score was ticking over nicely, again diminishing the gap with Mcann (74) still at the crease. After 27 overs Sharks CC only needed 4 runs an over in the last 13 overs to win. N Khanna cleverly bowled his slower ball to dismiss A Brown in the 30th over, pushing the ball to S Ali at mid wicket who took a skillful low catch by his ankles! Unfortunately the tail didn’t wag for the Sharks and they were all out for 184 with still 7 overs in hand. Marsa won by 29 runs thanks to the tight bowling at the end by N Khosla and N Khanna. It was a fine game of cricket which could have gone either way. 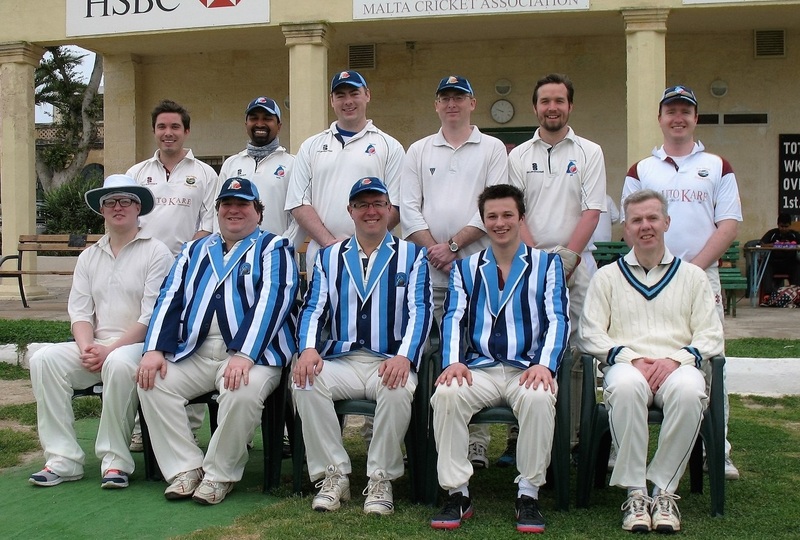 On Sunday 3rd Marsa again beat Sharks CC by 8 wickets thus winning the series 2 – 0.